Tonight at Village Underground in London, Mixmag Live welcomes Detroit's Carl Craig. After recently celebrating the 20th anniversary of his Planet E imprint, the producer, composer and DJ will be guest editing a selection of the magazine as well as performing the show. Hailed as a creative visionary ever since releasing his first track in 1989, under his own name and a variety of aliases (including 69, Paperclip People and Innerzone Orchestra), Carl Has been responsible for such classics tracks as 'Sandstorms', 'Throw' and 'Bug In A Bassbin'. Carl has remixed everyone from Theo Parrish to LCD Soundsystem - and along the way has even been nominated for a Grammy. He has performed live alongside Villabos, Luciano, Richie Hawtin and others and his Planet E imprint has given home to a wide range of Detroit-based artists such as Francesco Mora Catlett, Naomi Daniel, Moodyman and Kevin Saunderson. 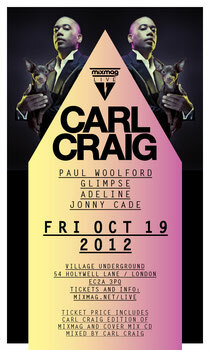 Those attending the event will receive a copy of the October issue of Mixmag as well as Carl's cover mix CD. Support tonight comes from Paul Woolford, Glimpse, Adeline and Jonny Cade. Tickets: www.mixmag.net/live.